After total destruction of the Earth, all that is left of humanity is on one gigantic spaceship, the Noah, en route to Canaan, a planet at another star, so far away that the journey will take more than 1,000 years. The ship is huge. Under a dome the habitat is comprised of cities, countryside and vertical farms. People live in houses, apartments, even skyscrapers. They drive cars, ride in buses and trains. The sky, the sun, the moon, the stars are all simulations. So is day and night, and the seasons. People live ordinary lives, have jobs, go to school, compete for positions, love, hate, fight, and play. All the while the ship moves at relativistic speed toward a new home. Hana Dempsey is a city planner. She is high up in the social hierarchy. When the story starts, the ship has been traveling for 340 years, with another 700 or so to go. Imagine living your entire life inside a ship, an enclosed system, without any opportunity to ever get out. For us, 340 years ago was 1677, about 100 years before the American Declaration of Independence. That’s how long they have been traveling. Through Hana’s eyes, we get a snapshot of a civilization in such a “generation ship.” Hana and her friends become suspicious about strange and violent deaths, and they start investigating. Their findings pull them deeper and deeper into very dark secrets that the very ship itself seems to harbor. Their activities set off a revolution and popular uprising that not only threatens their way of life, but the mission itself, and therefore the existence of humanity. Can the uprising be quelled? Can order be restored? Can the ship continue its mission and keep traveling for many, many more centuries? The author uses the first person present tense method of narration. I seem to find books like this; just recently I read the trilogy on time travel by Nathan Van Coops, who also uses that writing approach. But Ramirez is clumsy with it, and I don’t think it works well. Some of the people use telepathy, as well as thought and memory exchange through brain implants, giving the humans communications methods that are more difficult to follow. It’s hard for the reader to tell if a person is thinking, or speaking, or sending telepathic messages. Sometimes the author also violates the point of view, and while Hana tells most of the story, sometimes he seems to switch to other viewpoints, confusing the reader even more. The Forever Watch wants to be a hard science fiction book, but there is too much far-out technology that it is almost distracting from the story, and the hard science starts feeling a little hokey at times. 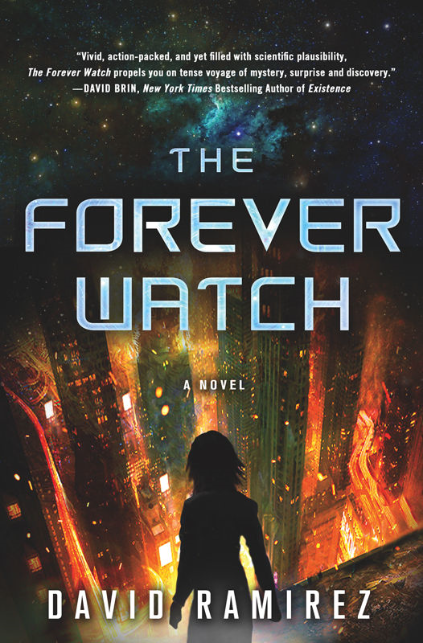 I don’t know why the title of the book is The Forever Watch. I really think there should have been a better title. While I was reading it, I could never remember what the title was. I just kept thinking of the generation ship book. How about The Noah? As you can see, I think the book has its flaws, and some reviewers have called it a tedious read. However, if you are into the sub-genre of generation ships, like I am, it is a book you must read, and you will enjoy. It is full of unique ideas and concepts, and while the author completes the story and makes The Forever Watch as standalone novel, there is ample opportunity for a sequel.